The Buzz Off training team has completed its first of two trips to Burma for 2017. 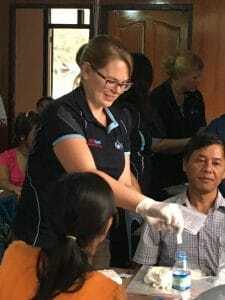 The team which sourced personnel from England, Holland, Myanmar, Australia and NZ trained 51 malaria volunteers in Myawaddy (Karen State) and Keng Tung (Shan State). This training took the total number of Burma based malaria volunteers trained by Buzz Off to 1,010. The team was very grateful for the team in our Yangon office for arranging the trip. Whilst on the road the team completed the new training manual which will come into use in 2018. Over recent years we have attracted many health care workers to our seminars and have rewritten the training manual to further improve and update it. The team will return to Myanmar in November to run training in Nagaland and Kachin state. Between trips we really need for increase the amunt of nets that we can distribute in-country this year we plan to distribute 7000 nets inside Myanmar, to date we have only had funds to buy 4500 LLIN nets. Your donation will help to save a life please send your donation through the Australian Mercy secure site.